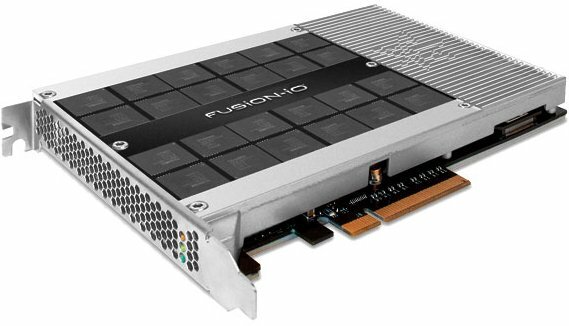 Fusion-io reveals the ioDrive2 and ioDrive2 Duo, a new series of high-end storage solutions for application acceleration and data center optimization. The fastest model is the 1.2TB ioDrive2 Duo, it offers SLC NAND flash memory with a max read speed of 3GB/s, max write speed of 2.6GB/s, read IOPS of 702,000 and write IOPS of 937,000. The ioDrive2 Duo also offers a 2.4TB MLC model, while the regular ioDrive2 series offers 400GB and 600GB units with SLC flash and 365GB, 785GB and 1.2TB editions with MLC. Pricing starts at $5,950. Fusion-io, Inc., (NYSE: FIO) pioneer of shared data decentralization, today announced the next evolution of its ioMemory platform for powering application acceleration and data center optimization. The company that broke performance barriers, brought you the first enterprise MLC products, dramatically enhanced reliability metrics for enterprise flash, and redefined server side flashhas done it all over again with the new ioDrive2 and ioDrive2 Duo. In a recent white paper sponsored by Fusion-io, analyst firm IDC looks at how Fusion-io technology can help to overcome the inefficiencies of traditional datacenter infrastructures. By solving the performance problems caused by traditional disk-based storage, the IDC paper, titled "Datacenter of the Future," reported that Fusion-io products can help to address today's highly virtualized datacenter environments by delivering higher data performance, reduced operational and capital expenses, and lower power consumption. The Fusion-io MLC ioDrive2 and ioDrive2 Duo will be offered in 365 GB, 785 GB, 1205 GB and 2.4 TB capacities, beginning in late November 2011, followed by SLC products in 400 GB, 600 GB and 1.2 TB capacities, with the first product run already committed to key customers and partners.Pricing for Fusion’s new ioMemory platform starts at a manufacturer’s suggested retail price of $5,950 U.S.